COMPANY PROFILE Facebook Inc is the world’s largest online social network. Its products are Facebook, Instagram, Messenger, WhatsApp, and Oculus. Its products enable people to connect and share through mobile devices and personal computers. Facebook is the world’s largest online social network, with more than 2 billion monthly active users. Users engage with each other in different ways, exchanging messages and sharing news events, photos, and videos. Its ecosystem consists mainly of the Facebook app, Instagram, Messenger, WhatsApp, and many features surrounding these products. Users can access Facebook on mobile devices and via desktop. Advertising revenue represents more than 90% of the firm’s total revenue, with 50% coming from the U.S. and Canada, and 25% from Europe. At the price of USD187.67 as at 01 Jun 2018, Facebook Inc is trading at a Price to Sales Ratio of 11.2 times last 12 months sales. This is a 18.0% discount to its historical average Price to Sales Ratio of 13.6 times. 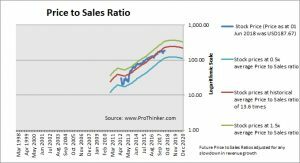 Is the stock undervalued? 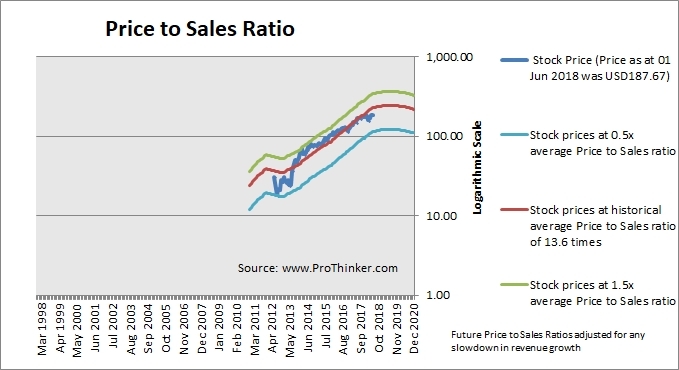 Just by looking at Price to Sales Ratio, it seems valuation is not demanding even if we factor in a reduction in Price to Sales ratios in future years. However, one should not just look at a single ratio to determine the fair value of a stock.